Just a quickie today. 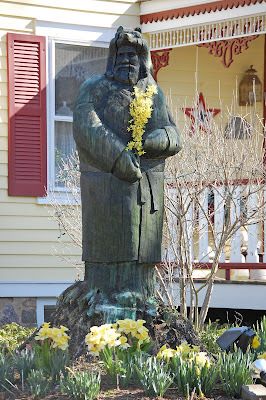 I wanted to show you my neighbor's statue, all decked out for spring. Happy Saturday! I think I want that guy protecting my house--he's in touch with his feminine side! 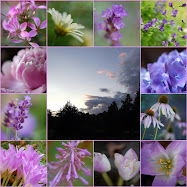 Thanks for dropping by..Your blog is just lovely,amazing photography ! !...Love all the flower pics. Ive added you to my faves..
Wow he's big....would love to hear the story behind him !!! Wow, I love it....that's fantastic! Is that created from a tree stump? I'd like a bird feeder or something, but that's an innovative idea. Your neighbors' house looks wonderful...can we see more? He who celebrates the seasons is a very wise man. Hi Mary! I've just been catching up with your blog ... love your photos in the post below. Those flowers are so pretty! Have a great weekend! wow, none of my neighbors have anything that interesting!! That mountain man is amazing...also, from what I can see of her front porch, it is very interesting, too! Thanks for sharing! Thats neat Mary! ...I absolutely adore that silver that you found in the back of the cupboard...oh my!!!! Is it too late to send you a pic of something?? Mary sweetie, when you have a spare moment, please stop by my place as I have something waiting for you there!